After the seminal Days of Future Passed (released in November 1967) that combined the Moodies' songwriting with Peter Knight's orchestral passages, The Moody Blues and their invaluable producer Tony Clarke carried on on their own devices, bursting with creativity, it seems. 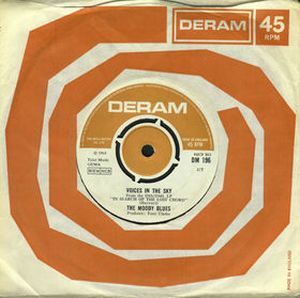 The next album In Search of the Lost Chord was released in July 1968. It is one of their classic-7 albums I consider worth full rating for its innovative, psychedelic and eclectic proto-prog nature, despite some unevenness. A couple of singles were also released from its material. This one comes with no non-album material unlike 'Ride My See-Saw'. 'Voices in the Sky' is easy to recognize as a Justin Hayward composition. The gorgeous melodies full of both dreaminess and emotional power, and the very nuanced arrangement (with a lot of Ray Thomas's flute) serving both of those things, to an almost symphonic effect. The use of vocal harmonies is superb. And the B side track 'Dr. Livingstone, I Presume' is just as unmistakably a Ray Thomas song. The joyful and mildly naiive approach approach was very typical for Thomas. This is a nice simple song and it makes you feel happy, but I don't count it among his finest compositions, and the repetition of the chorus line "We're all looking for someone" gets a bit too dominant. This single is very good when judged by the music only, but first and foremost it's just a sampler of a complete album that shows how much the Moodies were an album band, and a pioneering one at that.